I need to preface this recipe with a story that happened over 30 years ago. I was the director of a church preschool and happened to meet the coolest lady when enrolling her son in the program, Lanaya Sarkis (sorry for the spelling but it’s been a while and I’m not sure this is correct). Her dream was to be a race car driver which must have made an impression on me, oh yes along with her cooking! 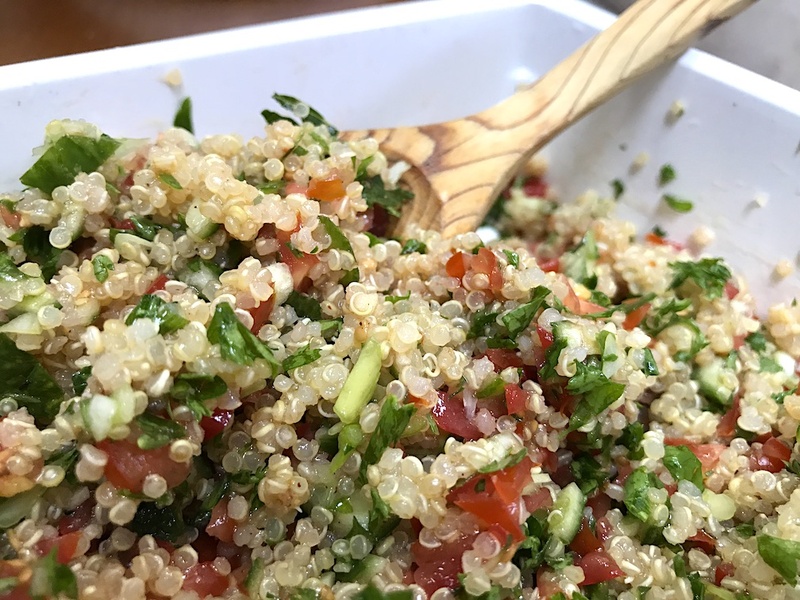 Her son became a friend of my son and we were invited for an authentic Lebanese meal at their home, I was smitten, yes, in love with her Tabbouleh or Tabbule. It became a staple in my home once I dragged the recipe out of her. Of course, she never wrote it down she just knew it! I’m sure her mother taught her and therefore no need since it was one of their main dishes during her childhood and I bet remains one today, wherever you are my friend. In addition to going gluten-free, I’ve tried to avoid grains. 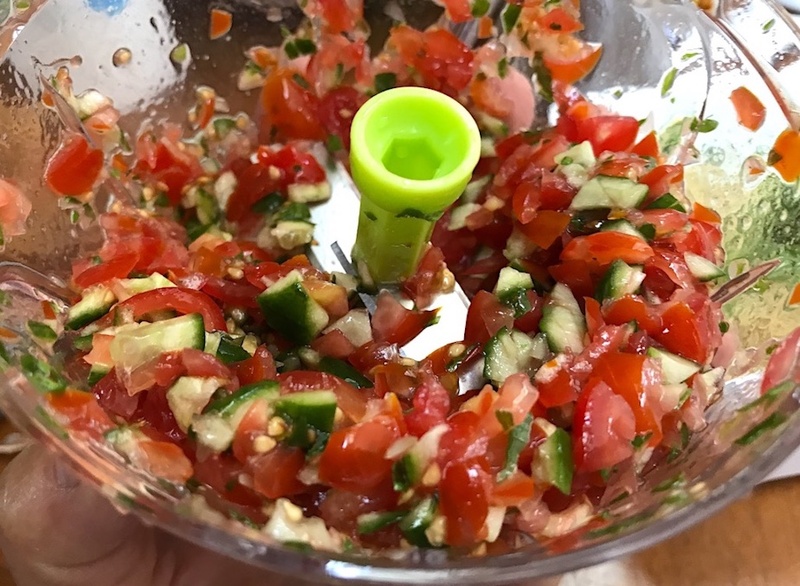 Thoughts of making Ms. Sarkis tabbouleh often crossed my mind and it wasn’t until last week when my husband bought me an herb garden for the boat that I decided to do some investigating. 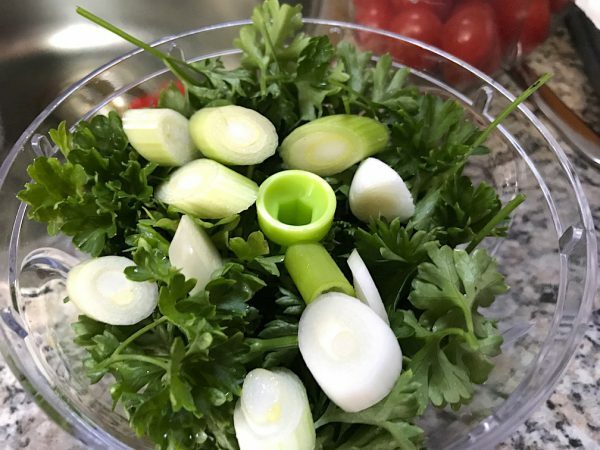 My parsley and mint were in full bloom and bringing back memories of my love affair with this delicious Lebanese salad. But what to use instead of bulgar? 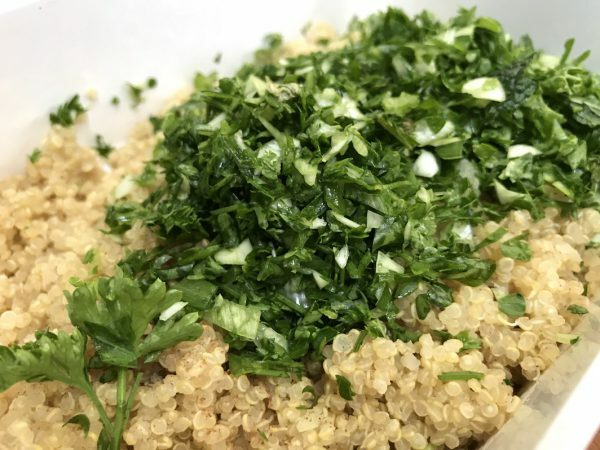 Bulgar was out of the question since it contains gluten. I looked at other grains and then got this brilliant idea to try making this with quinoa. 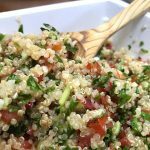 It is a grain but the benefits and nutrients outweighed my using corn, rice or any other grains, I did it and remembered Lanaya’s recipe by heart and struck up a new love affair with Quinoa Tabbouleh. 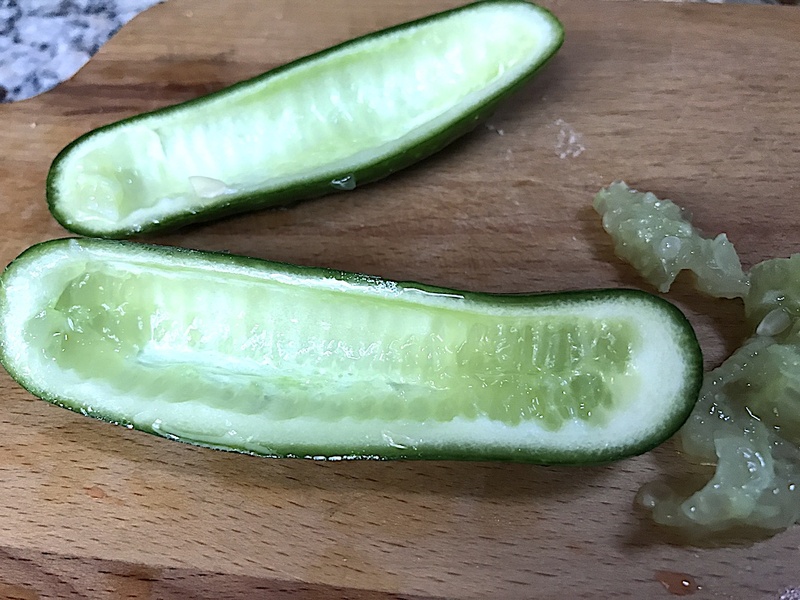 I hope you try this and are just as smitten by the flavor and fresh taste as I was. Once again your back in my life Lanaya Sarkis! I wonder where you are today and if your racing cars! 1 pinch cinnamon this was Ms Sarkis trick! Boil your water, salt and olive oil. 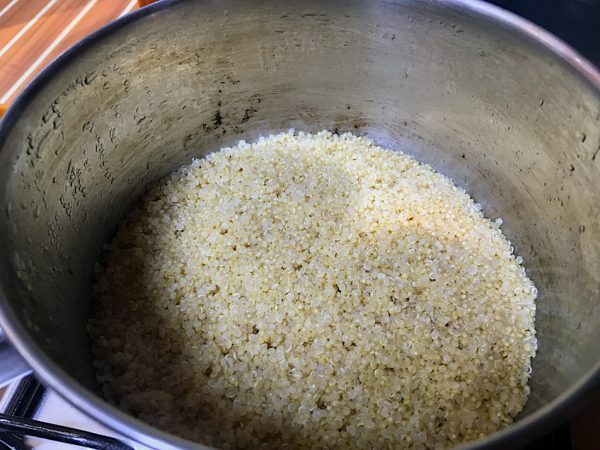 pour in 1/2 cup of quinoa. Place the lid on the pan. Turn heat to low and let it cook for 8 minutes. Turn the heat off and remove the lid. The water should be gone. If not simmer a few more minutes. Let it cool down while you prepare the rest of the ingredients. Place the cooled tabbouleh in a serving dish. Add your diced garlic. 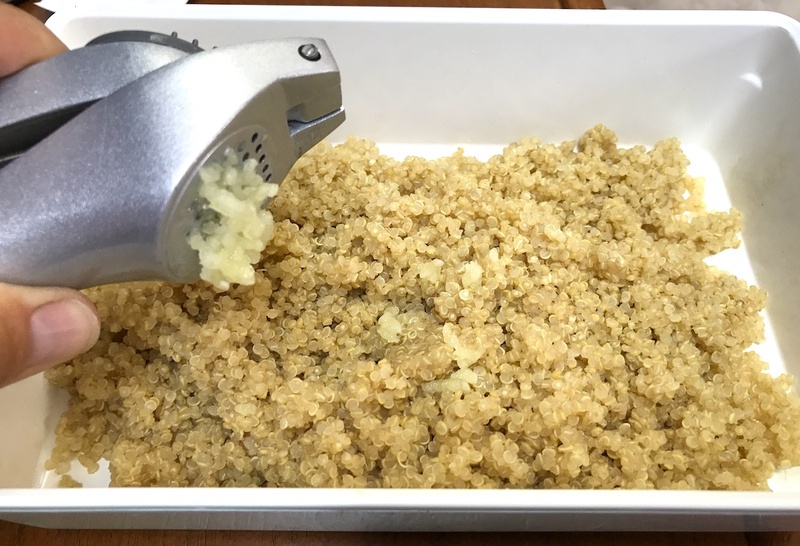 I used a press for my garlic and placed it right on top of the cooled quinoa. Wash your parsley, mint leaves, and green onion. Dice them. I used a little handheld dicer since I don't have all the luxuries of my kitchen on board. You can use one of your food processor gadgets as well. Lanaya always chopped her parsley by hand. Wonder if she has a food processor today? Wash and cut your cucumber in half lengthwise and scrape out and discard the seeds. They just add unwanted water to the dish. Dice or cut in small pieces if using a handheld dicer. Wash and dice your tomatoes or cut in pieces if using a dicer-like mine. I diced my tomatoes and cucumbers together and scooped them out with a fork to avoid adding the juice. As you can see, I didn't even clean out the parsley... it's that easy! Add your diced parsley. 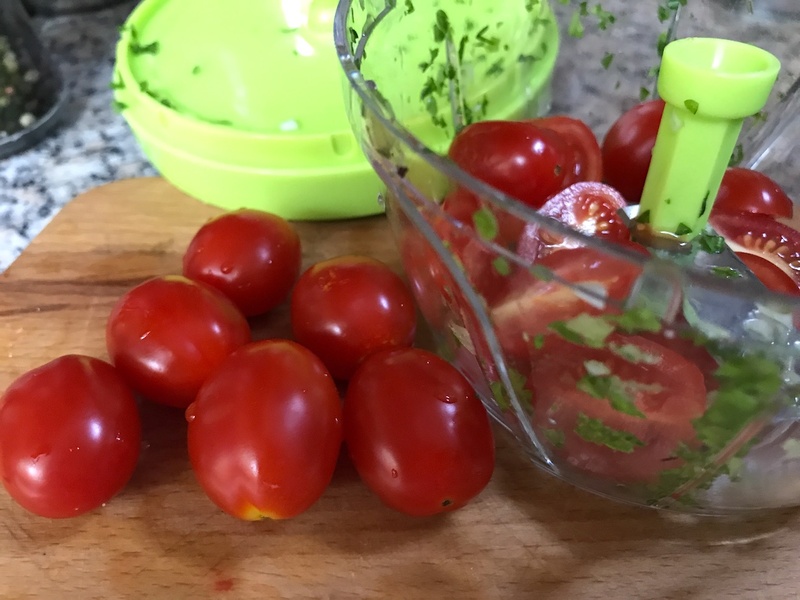 mint, green onion, and tomatoes. 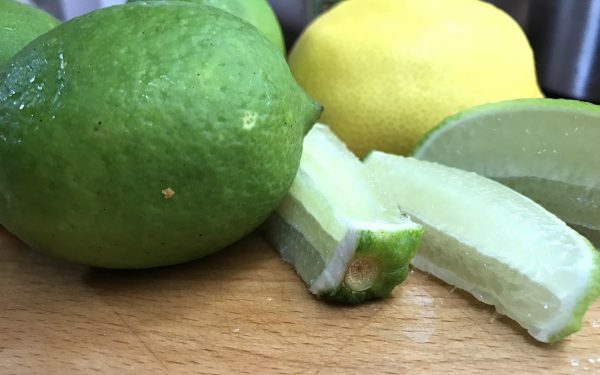 Sprinkle with the lime or lemon juice and a pinch of cinnamon. I like the lime juice myself. I also like to use a combo. 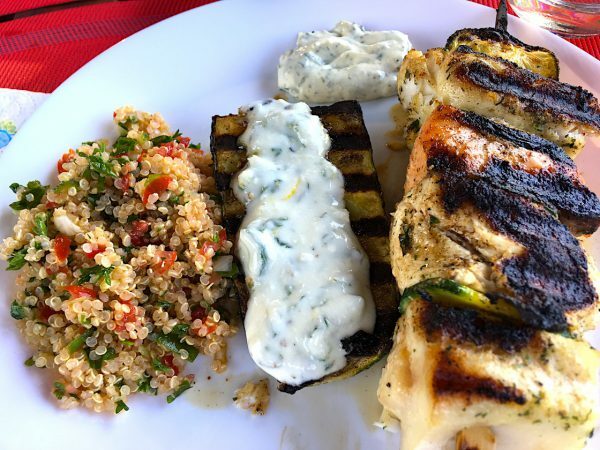 Give it a stir and serve it with a great piece of fish as we did, So delicious!